Dear Readers and Traders, in this article I want to make the summary of our gas option trading and in the second part I have some news for you. As I mentioned in the introductory part of this series, our goal is to show you our trading even when we are failing, when the market is against us. We do not want to hide anything from you. We did not do any trade last week. We could open new positions, but we did not want to increase the risk. The price of natural gas went up almost whole week against us, which was logically visible on the total portfolio performance, which was doing cumulatively -1.98%. If we would see a divergence between the fundaments and the price, that is, if the weekly price would go against us and the fundaments of natural gas prices would be worsen, we would probably slightly increase our short position. But since the fundamentals pointed to the next possible rise in gas prices, we stayed last week without further trades. In the last week summary, we talked about description of the various fundamental factors that are influencing the price. And since gas has been influenced by one significant factor in the past week, and that is development of weather, we will look at it more closely. 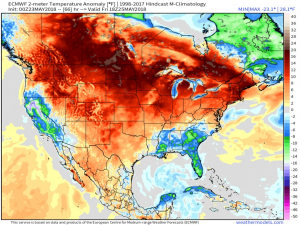 In the summer season, very high temperatures signify the need to burn natural gas to cover the increased demand for electricity that is used for air conditioning. 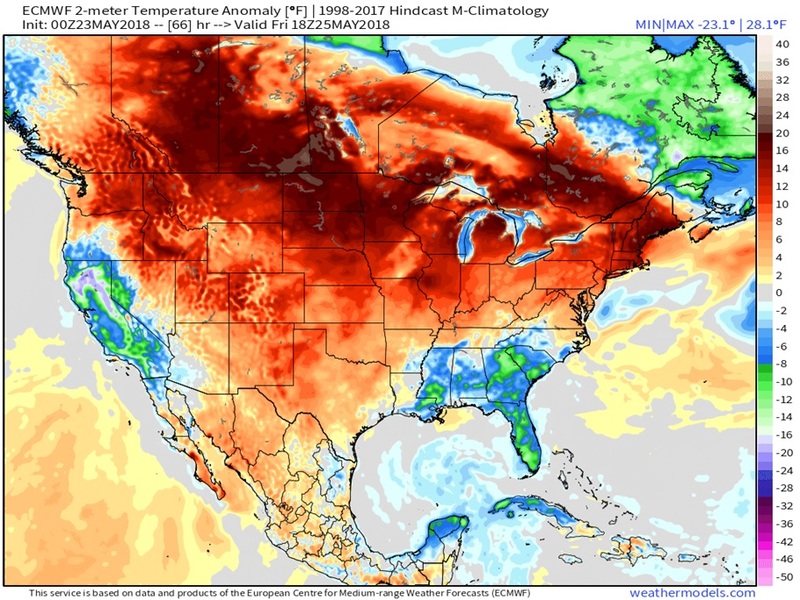 As we can see on the map below (we use weathermodels.com), last week temperature in the US was well above the long-term average. And now the important thing. Since we are now in a stock cycle after a very hard winter – that means the stocks of gas are relatively low in comparison to the long-term average, the market wants to see the increasing stocks towards the winter, otherwise it will drive the price of natural gas upward to support its production. We are now in a situation where the production is growing, but abnormally high temperatures increase natural gas consumption and prevent sufficient stock growth. The positive fact is that, according to predictions, there is a possibility of normalization of temperatures towards average and eventually also under the average temperatures it in the week between 8th and 15th June. This is also the last week of short-term weather models that are updated on a daily basis. If we will see in the future more and more of these predictions where temperatures are normalizing, we might be thinking about additional adjustments to the portfolio. If you have sign up with your email address in the box bellow my articles, you should have already received the login email to your client section here on Quastic. Then you should be able to see information and coments on our current trading – week after week. 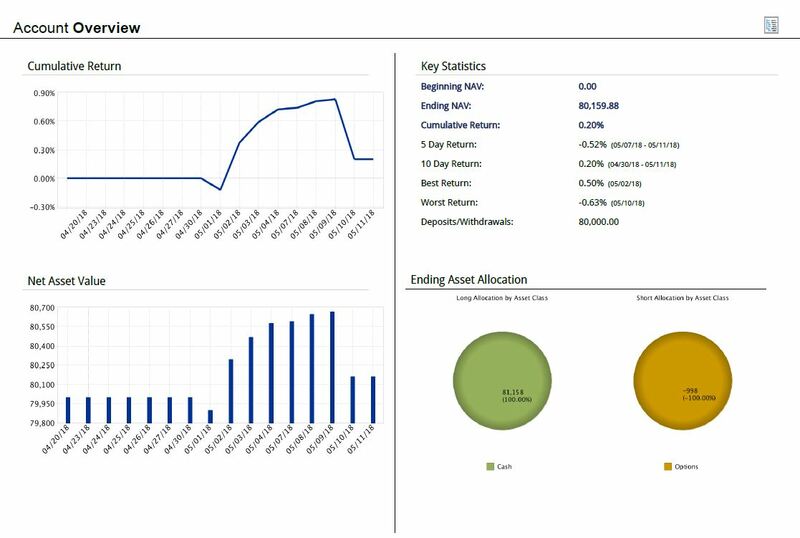 You also have the option to download the portfolio analysis report in pdf format. So, if you want to have access to this information, please enter your email in the box below.